Resize photos quickly and easily. Is there a better alternative to ImageXY? Is ImageXY really the best app in Image Editing category? Will ImageXY work good on macOS 10.13.4? 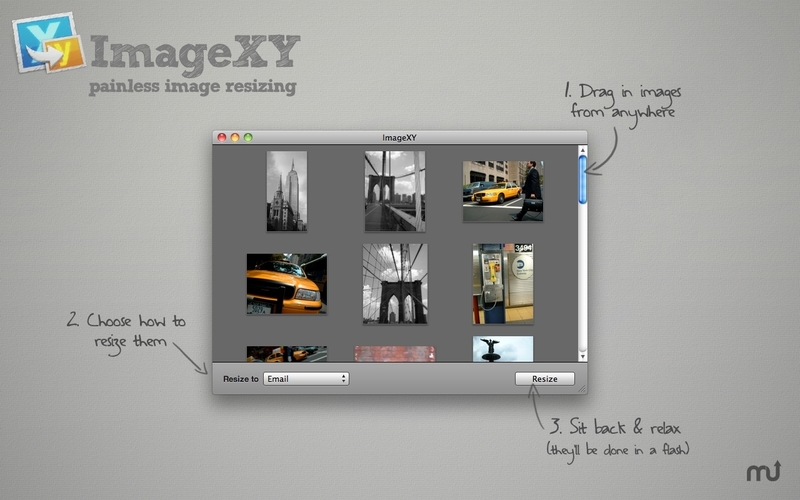 ImageXY allows you to resize all your photos quickly and easily with the click of a button. Drag & drop your images directly into ImageXY from wherever you keep them and select how you want them resized...it's that simple. resize jpg, gif, png, psd and pdf's? resize 100's of photos at once? create my own presets for certain image sizes? scale photos to a certain %? resize 1,000's of photos at once? drag photos directly in from iPhoto? resize images directly from the internet? resize images so I can quickly email them? drag in a folder and have it magically find all the images within it? resize 10,000's of photos at once? use ImageXY blindfolded with one hand tied behind my back? Can my Mom use ImageXY to resize photos without having to call me for help? The answer to all these questions is YES!!! Why not give ImageXY as a gift to your family and friends so they never again have to suffer trying to email or upload photos that are too big. Please email us or tweet (@imagexy) with any questions or issues you may have we are always happy to help.